Dr. Dianna Lenick is from West Virginia. She attended dental school in Baltimore, graduating from the Baltimore College of Dental Surgery in 1983. She completed a general practice residency in Baltimore and then took a position as an associate dentist in the Charleston, West Virginia area. After that, she went out on her own, practicing for several years as a solo dentist in Charleston. Dr. Lenick’s credentials are impressive. 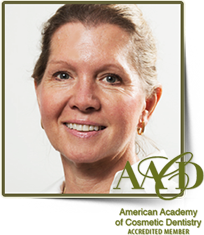 She is one of 300 dentists in the world to have earned Accredited status with the American Academy of Cosmetic Dentistry and was the second dentist in West Virginia to have earned this honor. Her hunger for continual learning is evident in her commitment to attend 50-70 hours of continuing education every year. She has assisted Dr. Jimmy Eubank in Plano, Texas with teaching his cosmetic dentistry courses. She is a member of the study group of Mark Piper & Jim McKee based in Chicago and is also a member of the Greg Kinser East Coast study club. What Sets Dr. Dianna Lenick Apart? Her gentle touch, caring demeanor, and perfectionist personality all contribute to making your visit to her office so special. But what really sets her apart is her passion for creating beautiful smiles. This is because she has witnessed time and time again the potential a beautiful smile has to dramatically impact and change someone’s life. One particular case that stands out is the story of a teenage girl that attended a high school in Charleston, West Virginia. This patient shared that she constantly found herself hiding her smile and seemed to be overly concerned about how it looked. When Dr. Lenick completed her dental bonding treatment, she was speechless. She literally began to cry and was stunned at how her smile had been transformed. This experience impacted this young girl so greatly that she has decided to follow in the footsteps of Dr. Lenick by pursuing a career in cosmetic dentistry. The list goes on. Her training at the prestigious L.D. Pankey Institute, located in Key Biscayne, Florida, continues to uniquely qualify her. Dr. Lenick has achieved Scholar at the Pankey Institute and is an active member that has been elected to their Board of Advisors. This Institute is considered the pre-eminent post-graduate dental education institution in the country. Dr. Lenick is married to Dr. John Vargo, a board-certified periodontist. They have two grown children.